Review: I’ll be honest. I went into this knowing next to nothing about the Hulk (or much about superheroes in general) save for what I’d seen in the movie theater. I picked up The Totally Awesome Hulk, Volume 1 purely because it was Korean Hulk! What! Yes. I spent a lot of the volume trying to figure out how Amadeus Cho fit into the whole superhero world, where he came from, who he was previously, and trying to reconcile it to the hormonal, green monster he was in the story. I think some of the disorientation was certainly due to my total ignorance on superhero lore. Despite the cluelessness that I brought to the table, I still managed to thoroughly enjoy reading Amadeus as the Hulk. I especially loved his interactions with his genius sister, who helped keep him grounded with snark and remote controlled robot advice. It’s definitely an action packed, mostly light-hearted adventure. 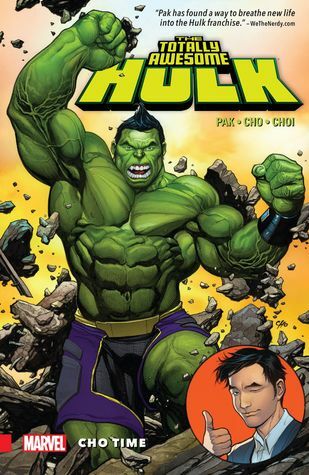 I’m looking forward to reading more of Amadeus Cho as Hulk. I want to learn more about who he is (and was), and I’d recommend it to just about anyone — even if you’re totally clueless about superhero stuff, like me. It’s not hard to dive into, regardless of your background. I’m loving the trend of more PoC in superhero comics, and hope to see more and more of that. Also on my list is the Superman comics starring Kenan Kong by Gene Luen Yang and more of Kamala Khan as Ms. Marvel. Dipping my toe into superhero comics is going swimmingly so far.